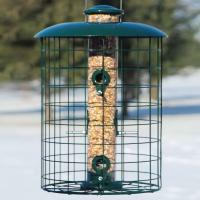 We have had one of these feeders for several years and find it to be absolutely squirrel-proof. They try constantly but fail. It holds a lot of seeds which last about 2 weeks. 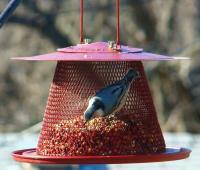 It is economical because the seeds actually go to the birds, not to the squirrels and chipmunks. Because of its heavy metal construction, with no plastic parts, it has survived 4 or 5 bear attacks and only needed to have the wire mesh and hanger bent back into shape. It is the best feeder we have ever had. The pluses outweighs the minor negatives. On the plus side, the basic design is great! The large storage area is wonderful. The clear plastic around the feeding stations allow you to see when it's time to refill, which despite the constant bird traffic, is about once every 2 weeks. The clips solution for keeping the filler cap on top of the unit squirrel-proof is a little bit "after-thought engineering". How about a twist off/on cap. 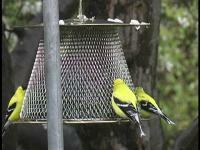 The one thing that they should do, is not bother plastic/rubber coating the cages that surround the feeder. The squirrels have bitten that into submission. It looks like hell now. Why not make it out of stainless steel and leave it at that? One thing to consider when buying this unit is the weight of the unit when filled is very heavy. Like I say, the negatives are minor design flaws. The overall design is good. 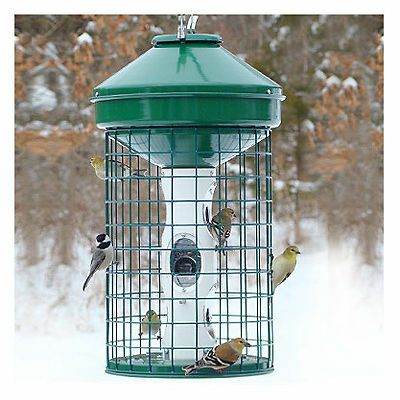 We like this feeder because when we leave for two months in the winter our son doesn't have to fill it every week. However, those pesky little red squirrels despite a baffle have jumped as far as six feet to get into the feeder and chewed holes into the plastic feeder ports. Otherwise this is a splendid feeder.